My blog-post gap is due to a little case of "It's now September, so now what do I do with my life". Did I figure it out? Well no. Every year it happens. Every year I'm alarmed that it has happened. Perhaps if I bought one of those old-fashioned brocade tufted fainting couches and made a needlepoint cushion that says "It's September, Let's be Melancholic" I might remember that this has happened before and all I need to do for the next month is recline, sigh, and read sad books about sad lives while eating good chocolate. Fortunately for me and this blog post, it hasn't all been clouds and smelly socks, last week I went to Landscape Ontario's new Fall show. It's earlier and it's in a new location: The Ancaster Fairgrounds. They're further away for me, but closer for the growers and many of the folks doing business that week. Also, having the show so early in the Fall season, so many of the plants are still looking good - the suppliers don't have to scrape around trying to find something to make an attractive display. Now the 'Purple Gentleman' Penstemon might just make it through, but the beautiful and unusual 'Mighty Velvet' Stachys is a solid Zone 8 - so learn to love it and let it die if you're on this side of the Mason-Dixon Line. The HGTV tags have quite a bit of information. Just wonder if the homeowner will read it? Now if they're being truthful, look what a great plant this will be - only 1.5M high and 1.25M (5x4 feet) wide. So many of the Physocarpus tend to be taller and not as compact as 'Burgundy Candy' looks. Nice large leaves too - would be interested to see this one in my garden. Over at Blue Sky Nursery they had several little oddities on display. 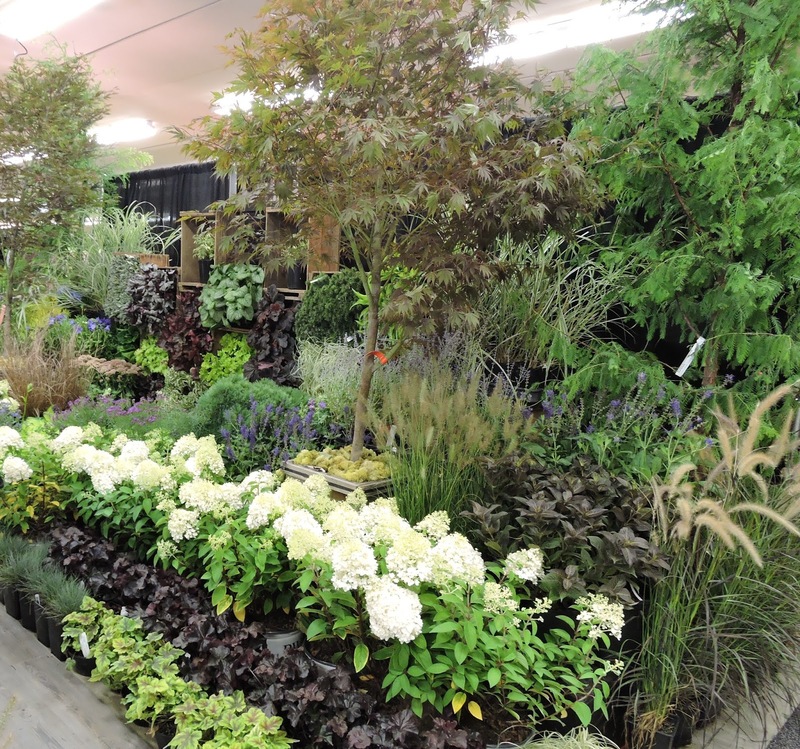 For people in the Oakville/Mississauga area, they said that you could request these plants at Bulows. 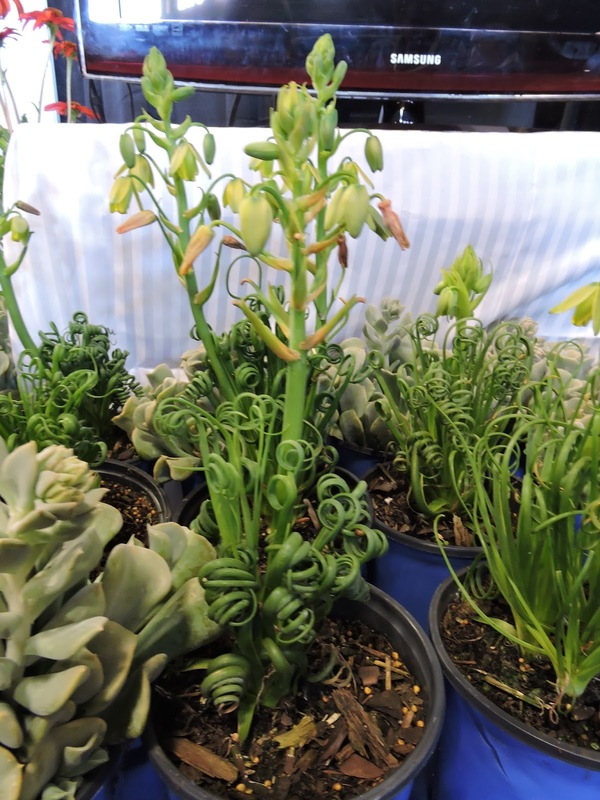 This Albuca is called 'Frizzle Sizzle'. Although it's a Zone 6, I'm thinking it's a cool house plant rather than something you could count on in the garden. Echinacea colours and vigour are getting better and better. The Sombrero series was really pretty. The folks at Valleybrook Nurseries say they sell these out immediately to nurseries as soon as they're in bloom. And with the focus of perennials in bloom at the nursery, look for shorter, beefier little plants. 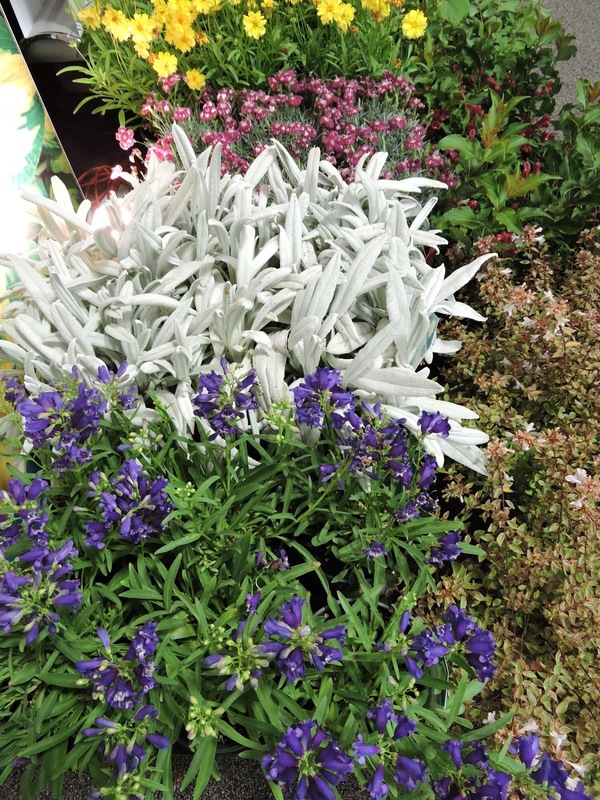 If you can't keep it tidy on the nursery bench - it isn't going to make it to the market. This little Anemone 'Fantasy Cinderella' was sweet. I was given a sample of Bush Honeysuckle 'Kodiak Orange' to try - great colour in the centre here. It really had trouble and so I've had to cut it back drastically. Will be interesting to see if I get it to winter over given its rough start. Thought that this was very pretty - although no flowers other than the tag. More new-to-me plants over at Terra Nova. They asked their suppliers (again Blue Sky Nursery) to send over some material for their booth. Here is a Mukgenia - half Mukdenia & Berginia. Nice flowers in the spring - not evergreen. Now this is a good sized leaf! Heuchera 'Spellbound'. Just fantastic what Terra Nova's breeding program has been able to do for Coral Bells. As you may know, Terra Nova has a huge breeding program for Echinacea as well. I've become concerned about the pests I've had completely destroying the blossoms mid-summer. Scott Christy has promised to let me know what they're doing about it in their fields on the west coast - as soon as I have the intel, I promise to share. Until then! Not sure if this is what your melancholy is like, but at the first signs of fall I kind of go into mourning, sad at all that I didn't accomplish in the garden, sad it didn't last longer. But when I get to a point of acceptance (usually after a few colchicums bloom), then I am able to enjoy what fall has to offer. I had Sugar Tip and it barely made it through one winter and didn't make it through a second. Not sure if it was cold temps per se or it wanted better draining (meaning not heavy clay) soil. The seed I am supposed to send you is sitting in paper bags on my desk, waiting to be cleaned and mailed off. I am waiting for a rainy day, which we are sorely lacking. Hi Kathy, it's dramatic - the French word douleur seems to fit it best. There is no accomplishment in my life that I can't diminish. You can imagine relief it is to have it behind me! Good to know about Sugar Tip - I'm thinking if you had problems, with our ever-colder winters of the last couple of years, best to leave this one in the nursery where it belongs. I know what you mean about the rain - the garden soil looks like dust. Seems like such a pity to drag the hose out at this point in the season, but I may have to with some of the newer stuff. 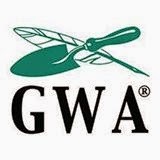 Looking forward to my seeds - should have a few more good things for you to dump and scatter around your garden as well. I totally agree with Kathy. And with you. The bummer of living in a northern climate. Maybe Texans feel it in late spring--how it's going to be too hot for three months--similar to how we feel it's going to be cool and then really cold for five months! Oh well, we have the best summers, right? ;) I chuckled with your introduction. And wow--that large-leafed Coral Bell is impressive! Barb girl I am so jealous of your get together(s) with nursery companies ! Do you get to take some of these beauties home with you .. 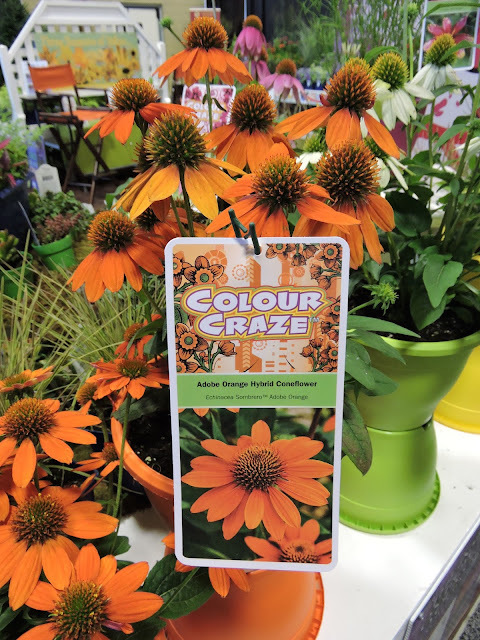 I would be the first to grab that Kodiak Orange and the Adobe Orange coneflower !! I think this whole year has been one big mystery to me anyways ... I might just be losing my touch ! Nice to see some new plants even if they aren`t hardy to our zone ... I like the trend of being smaller but still with big bang personalities !! Sadly, no prezzies this time - but it was fun to have a look-see at everything, and get some intel for next year. I'm with you on the must-haves! I've been sooooo neglectful with my garden - back looking ok, front not so much. You're not losing your touch - your garden is simply not behaving. It really is a head-scratch this year - I had been suffering from the deadly sin of Pride - everything was looking pretty good, then the drought and the disgusting mildews followed by black droops - looks like everything needs to have a good leg shave - yuckeroo. Fortunately I think we've got a couple of nice days on the agenda & can go out for some remedial action.